^ a b CRC Handbook of Chemistry and Physics (92nd ed.). (2011-2012). p. 4-88(2470,viterous). ISBN 978-1-4398-5512-6. ^ Heaney, P. J. (1994). "Structure and chemistry of the low-pressure silica polymorphs". Reviews in Mineralogy. 29. ^ Coes, L. Jr. (31 July 1953). “A New Dense Crystalline Silica”. Science 118 (3057): 131–132. Bibcode: 1953Sci...118..131C. doi:10.1126/science.118.3057.131. PMID 17835139. ^ Robert M. Hazen (22 July 1999). The Diamond Makers. Cambridge University Press. pp. 91–. ISBN 978-0-521-65474-6. https://books.google.com/books?id=fNJQok6N9_MC&pg=PA91 2012年6月6日閲覧。. ^ Wirth, R; Vollmer, C; Brenker, F; Matsyuk, S; Kaminsky, F (2007). “Inclusions of nanocrystalline hydrous aluminium silicate "Phase Egg" in superdeep diamonds from Juina (Mato Grosso State, Brazil)”. Earth and Planetary Science Letters 259 (3–4): 384. Bibcode: 2007E&PSL.259..384W. doi:10.1016/j.epsl.2007.04.041. ^ Fleischer, Michael (1962). “New mineral names” (PDF). American Mineralogist (Mineralogical Society of America) 47 (2): 172–174. http://rruff.info/uploads/AM47_805.pdf. ^ Chao, E. C. T.; Shoemaker, E. M.; Madsen, B. M. (1960). “First Natural Occurrence of Coesite”. Science 132 (3421): 220–2. Bibcode: 1960Sci...132..220C. doi:10.1126/science.132.3421.220. PMID 17748937. ^ O'Brien, P.J., N. Zotov, R. Law, M.A. Khan and M.Q. Jan (2001). “Coesite in Himalayan eclogite and implications for models of India-Asia collision”. Geology 29 (5): 435–438. Bibcode: 2001Geo....29..435O. doi:[[doi:10.1130%2F0091-7613%282001%29029%3C0435%3ACIHEAI%3E2.0.CO%3B2|10.1130/0091-7613(2001)029<0435:CIHEAI>2.0.CO;2]]. ^ Schertl, H.-P.; Okay, A.I. (1994). “A coesite inclusion in dolomite in Dabie Shan, China: petrological and rheological significance”. Eur. J. Mineral. 6 (6): 995–1000. doi:10.1127/ejm/6/6/0995. http://eurjmin.geoscienceworld.org/content/6/6/995.short. ^ Dera P; Prewitt C T; Boctor N Z; Hemley R J (2002). “Characterization of a high-pressure phase of silica from the Martian meteorite Shergotty”. 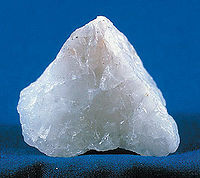 American Mineralogist 87: 1018. http://rruff.geo.arizona.edu/AMS/authors/Boctor%20N%20Z. ^ Lager G. A.; Jorgensen J. D.; Rotella F.J. (1982). “Crystal structure and thermal expansion of a-quartz SiO2 at low temperature”. Journal of Applied Physics 53 (10): 6751–6756. Bibcode: 1982JAP....53.6751L. doi:10.1063/1.330062. ^ Wright, A. F.; Lehmann, M. S. (1981). “The structure of quartz at 25 and 590 °C determined by neutron diffraction”. Journal of Solid State Chemistry 36 (3): 371–80. Bibcode: 1981JSSCh..36..371W. doi:10.1016/0022-4596(81)90449-7. ^ a b Kihara, Kuniaki; Matsumoto, Takeo; Imamura, Moritaka (1986). “Structural change of orthorhombic-Itridymite with temperature: A study based on second-order thermal-vibrational parameters”. Zeitschrift für Kristallographie 177: 27–38. Bibcode: 1986ZK....177...27K. doi:10.1524/zkri.1986.177.1-2.27. ^ Downs R. T.; Palmer D. C. (1994). “The pressure behavior of a cristobalite”. American Mineralogist 79: 9–14. http://www.geo.arizona.edu/xtal/group/pdf/AM79_9.pdf. ^ Wright, A. F.; Leadbetter, A. J. (1975). “The structures of the β-cristobalite phases of SiO2 and AlPO4”. Philosophical Magazine 31 (6): 1391–401. Bibcode: 1975PMag...31.1391W. doi:10.1080/00318087508228690. ^ Shropshire, Joseph; Keat, Paul P.; Vaughan, Philip A. (1959). “The crystal structure of keatite, a new form of silica”. Zeitschrift für Kristallographie 112: 409–13. Bibcode: 1959ZK....112..409S. doi:10.1524/zkri.1959.112.1-6.409. ^ Miehe, Gerhard; Graetsch, Heribert (1992). “Crystal structure of moganite: a new structure type for silica”. European Journal of Mineralogy 4 (4): 693–706. doi:10.1127/ejm/4/4/0693. ^ Levien L.; Prewitt C. T. (1981). “High-pressure crystal structure and compressibility of coesite”. American Mineralogist 66: 324–333. http://www.minsocam.org/ammin/AM66/AM66_324.pdf. ^ Smyth J. R.; Swope R. J.; Pawley A. R. (1995). “H in rutile-type compounds: II. Crystal chemistry of Al substitution in H-bearing stishovite”. American Mineralogist 80: 454–456. http://rruff.geo.arizona.edu/doclib/am/vol80/AM80_454.pdf. ^ Dera P.; Prewitt C. T.; Boctor N. Z.; Hemley R. J. (2002). “Characterization of a high-pressure phase of silica from the Martian meteorite Shergotty”. American Mineralogist 87: 1018. http://rruff.geo.arizona.edu/AMS/authors/Boctor%20N%20Z. ^ Skinner B. J.; Appleman D. E. (1963). “Melanophlogite, a cubic polymorph of silica”. American Mineralogist 48: 854–867. http://www.minsocam.org/ammin/AM48/AM48_854.pdf. ^ Nakagawa T.; Kihara K.; Harada K. (2001). “The crystal structure of low melanophlogite”. American Mineralogist 86: 1506. http://rruff.geo.arizona.edu/AMS/minerals/Melanophlogite. ^ Rosemarie Szostak (1998). Molecular sieves: Principles of Synthesis and Identification. Springer. ISBN 0-7514-0480-2. https://books.google.com/?id=lteintjA2-MC&printsec=frontcover. ^ Greenwood, Norman N.; Earnshaw, Alan (1984). Chemistry of the Elements. Oxford: Pergamon Press. pp. 393–99. ISBN 0-08-022057-6. ^ Weiss, Alarich; Weiss, Armin (1954). “Über Siliciumchalkogenide. VI. Zur Kenntnis der faserigen Siliciumdioxyd-Modifikation”. Zeitschrift für anorganische und allgemeine Chemie 276: 95–112. doi:10.1002/zaac.19542760110. ^ Björkman, T; Kurasch, S; Lehtinen, O; Kotakoski, J; Yazyev, O. V.; Srivastava, A; Skakalova, V; Smet, J. H. et al. (2013). “Defects in bilayer silica and graphene: common trends in diverse hexagonal two-dimensional systems”. Scientific Reports 3: 3482. Bibcode: 2013NatSR...3E3482B. doi:10.1038/srep03482. PMC: 3863822. PMID 24336488. https://www.ncbi.nlm.nih.gov/pmc/articles/PMC3863822/.